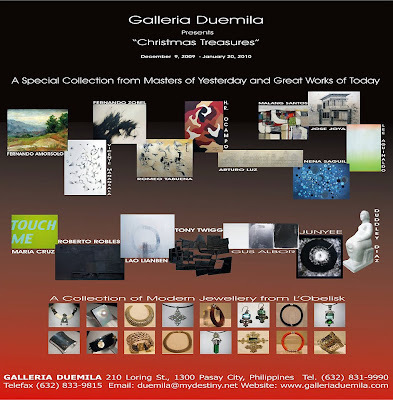 Galleria Duemila presents “Christmas Treasures” - A Special Collection From Masters of Yesterday and Great Works of Today + A Collection of Modern Jewellery from L’Obelisk. Revealing the most enduring artworks, the exhibition will feature modern art of the Philippines at its greatest. This is the first exhibition ever to explore the rich fusion of the most beautiful art pieces from the old masters and the contemporary ones. The coming together of priceless jewellery and art pieces make for the cultural magnificence of the show thus dubbed Christmas Treasures. Only the finest from the most respected artists are showcased as their representative works played a crucial role in stimulating and promoting modern art in the Philippines. One could only marvel at how adventurously far these locally and internationally acclaimed artists carried the realm of the arts of the country. Fernando Amorsolo, the master of genre discovered and portrayed light at its utmost brilliance. Fernando Zobel, the epitome of experimentation, used a hypodermic syringe to achieve distinctive effects of line in his abstract meditations on movement. Hernando Ruiz ‘H.R.’ Ocampo’s skillful use of intense and bold colors composes an abstraction that seemed to swell and multiply endlessly. Nena Saguil’s signature works depicts a mystical ambiance as her orbs, spheres, and circles inspire a likeness to the cosmos. Jose Joya’s first works were mostly representational but gradually shifted to abstract painting and became one of the leading painters in this genre. Arturo Luz’s linear works are at their most playful, his geometric abstracts allude to order and elegance. Vicente Manansala, prominent as a cubist painter and illustrator, is the master in images of transparent and delicate tones. Mauro ‘Malang’ Santos, known for his colorful genre paintings of simplified forms, popularized "Art for the Masses.” Leopoldo ‘Lee’ Aguinaldo is known for his austere abstraction in minimalist linear forms. Romeo Tabuena’s studies done in a monochromatic style exhibits a cubist influence, as seen in their jagged, angular features. Roberto M.A. Robles reveals a poetic, Zen-like attribution to his pieces. Maria Cruz, a deeply accomplished artist, manifests the essence of worth and value in her creative process. Junyee’s art engages scrutiny and wonder in his use of soot on board. Tony Twigg weaves style and sophistication in his timber constructions. Duddley Diaz takes on the language of religion, communicating to the soul in marble. Gus Albor’s aesthetic utilizes the essence of space like the commas in poems, they speak in a beautiful silence. Lao Lianben’s art springs from the quintessence of words made manifest in the most abstract interpretation. Exquisite jewellery designed by Hermin Aslanian for L’Obelisk, uniquely crafted by Ketut, a master silversmith of Java are also on display. The embellishments of precious stones such as obsidian, amethyst, topaz, aquamarine, turquoise, peridot, ruby, quartz, and pearls on the silver accessories are believed to emit psychic and seductive power. Wearing the accessories made of ting rattan from the vines of a holy tree are believed to make the inhabitants of Java live longer. These intricately crafted fine silver made into a beautiful collection of rings, bracelets, cufflinks, earrings, chokers, and necklaces will dazzle you. “Christmas Treasures” runs from December 9, 2009 until January 20, 2010. For more information, contact Galleria Duemila through Tel. No. (632) 831-9990 or Telefax (632) 833-9815, e-mail: duemila@mydestiny.net or visit Galleria Duemila website. The gallery is located at 210 Loring Street, Pasay City.